Hi, all! How’s your week going? Well, we got about 10 inches of snow here yesterday ….when Accuweather said about 2-4 for our area. We got hammered. And it’s still snowing lightly. My nugget’s kids’ paint was put off until tonight, so hopefully it stops snowing. The forecast is calling for more yet this week, so we shall see! 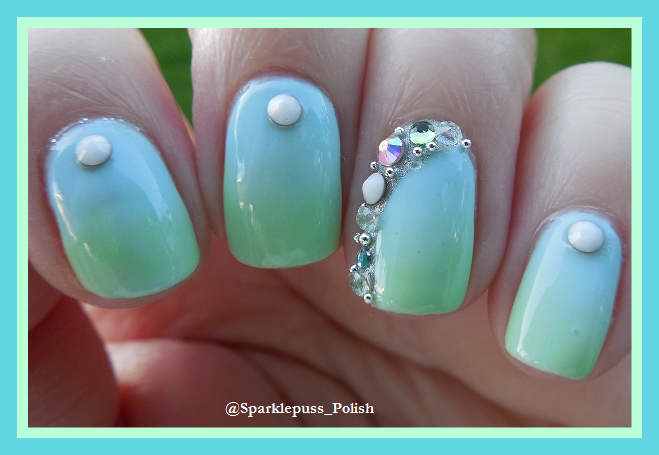 I finally have for you the nails I wore for St. Patrick’s Day! It wasn’t what I had planned, but sometimes the things we picture in our heads just don’t pan out. So, the stamped nails are what I had planned. I also wanted to do a gold to green gradient on the gold nails. For some reason, I thought a jelly polish would be ideal. That didn’t work. Then I added green glitter to the gold. Meh. Finally, I had the boyfriend take the polish off those nails and I laid down a fresh layer of gold. So there on my pinky and index fingers is Ziv by Zoya, a beautiful gold foil. On my other fingers I did one coat of Sugar Cube by Salon Perfect and then one coat of Cherokee Rose by Lucky 13 Lacquer. Cherokee Rose is not available anymore, but you never know what you may find in the Nearly No Rules polish buy, sell, trade group on Facebook. On top of that, I used Pueen Amazon Moss stamping polish and Born Pretty plate BP50. It’s a very simple mani, but I really am satisfied with the final outcome. This is the first year I didn’t do any rainbow nails, which I thoroughly love doing. I promise the next mani won’t be green! I really like that gold!! I seriously lacked on art for st. Patrick’s Day. You rocked it! This is really cute! You pulled everything together perfectly.